The facial nerve is composed of approximately 10,000 neurons, 7,000 of which are myelinated and innervate the nerves of facial expression. Three thousand of the nerve fibers are somatosensory and secretomotor and make up the nervus intermedius. The course of the facial nerve and its central connections can be roughly divided into the segments listed in Table 1, below. By the third week of gestation, the facioacoustic primordium gives rise to CN VII and VIII. During the fourth week, the chorda tympani can be discerned from the main branch. The former courses ventrally into the first branchial arch and terminates near a branch of the trigeminal nerve that eventually becomes the lingual nerve. The main trunk courses into the mesenchyme, approaching the epibranchial placode. The geniculate ganglion, nervus intermedius, and greater petrosal nerve are visible by the fifth week. The second branchial arch gives rise to the muscles of facial expression in the seventh and eighth week. To innervate these muscles, the facial nerve courses across the region that eventually becomes the middle ear. By the eleventh week, the facial nerve has arborized extensively. In the newborn, the facial nerve anatomy approximates that of an adult, except for its location in the mastoid, which is more superficial. Crosby and DeJonge, along with Nelson, have provided 2 of the most complete descriptions of the facial nerve's central connections. [1, 2] The reader is referred to these references for a more detailed description of the supranuclear and nuclear organization of the facial nerve. This homunculus illustrates the location on the motor strip of facial areas relative to the hand and upper extremities. The lower half of the figure depicts the anatomy of the pyramidal system. Discharges from the facial motor area are carried through fascicles of the corticobulbar tract to the internal capsule, then through the upper midbrain to the lower brainstem, where they synapse in the pontine facial nerve nucleus. The pontine facial nerve nucleus is divided into an upper and a lower half, bilaterally. The corticobulbar tracts from the upper face cross and recross en route to the pons; the tracts to the lower face cross only once. In their study, Jenny and Saper found that the descending corticofacial fibers in monkeys innervated the lower facial motor nuclear region bilaterally but with contralateral predominance. The upper facial motor nuclear regions received scant direct cortical innervation on either side of the brain. The deficits observed with unilateral ablation of the corticobulbar fibers reflect the fact that upper facial motor neurons do not receive significant cortical innervations and that lower facial motor neurons contralateral to the lesion, which have functional loss, are dependent on direct contralateral cortical innervation, with the remaining ipsilateral cortical projections being insufficient to drive them. These findings may explain why a focal lesion in the facial area on 1 side of the motor cortex in humans spares eyelid closure and forehead movement but results in paralysis of the lower face. Caution is advised in using preservation of forehead function to diagnose a central lesion. Patients may have sparing of forehead function with lesions in the pontine facial nerve nucleus, with selective lesions in the temporal bone, or with an injury to the nerve in its distribution in the face. An accurate neurologic diagnosis is best made by examining deficits in conjunction with "the company they keep." A cortical lesion that produces a lower facial deficit is usually associated with a motor deficit of the tongue and weakness of the thumb, fingers, or hand on the ipsilateral side. Nerve fibers influencing emotional facial expression are thought to arise in the thalamus and globus pallidus. Supranuclear pyramidal lesions spare movements of the face initiated as emotional responses and reflexes. With nuclear and infranuclear lesions, loss of involuntary and voluntary facial movement occurs. The facial nerve nuclei also receive afferent input from other brainstem nuclei. 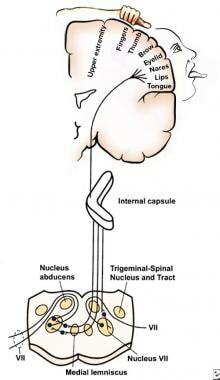 Input from the trigeminal nerve and nucleus form the basis of the trigeminofacial reflexes; eg, the corneal reflex. Input from the acoustic nuclei to the facial nerve nucleus forms part of the stapedial reflex response to loud noises. The extrapyramidal system consists of the basal nuclei and the descending motor projections other than the fibers of the pyramidal or corticospinal tracts. This system is associated with spontaneous, emotional, mimetic facial motions. The interplay between the pyramidal and extrapyramidal systems accounts for resting tone and stabilizes the motor responses. The masked facies associated with Parkinsonism are known to be the result of destruction of the extrapyramidal pathways. The facial dystonia seen in Meige syndrome is thought to be due to basal nuclei disease. A lesion in the lower midbrain above the level of the facial nucleus may cause contralateral paresis of the face and muscles of the extremities, ipsilateral abducens muscle paresis (due to effects on the abducens nerve), and ipsilateral internal strabismus. If the lesion extends far enough laterally to include the emerging facial nerve fibers, a peripheral type of ipsilateral facial paralysis may be apparent. The facial motor nucleus is located in the lower third of the pons, beneath the fourth ventricle. The neurons leaving the nucleus pass around the abducens nucleus as they emerge from the brainstem. Involvement of the facial nerve nucleus and VI nerve nucleus are suggestive of a lesion near the fourth ventricle. A lesion near the ventricle at the level of the superior salivatory nucleus may result in a dry eye in addition to a peripheral facial paralysis and abducens paresis. Many syndromes are known to result from pontine lesions, some of which are summarized in Table 3, below. The facial nerve emerges from the brainstem with the nerve of Wrisberg, ie, the nervus intermedius (see the image below). 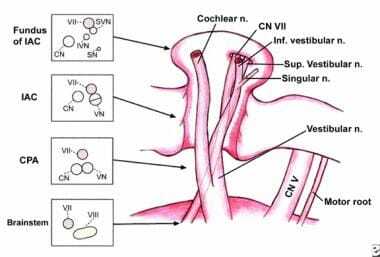 The nervus intermedius gained its name from its position as it courses across the cerebellopontine angle (CPA) between the facial nerve and the vestibulocochlear nerves (ie, CN VII, CN VIII). The average distance between the point where the nerves exit the brainstem and the place where they enter into the internal acoustic meatus (internal auditory canal [IAC]) is approximately 15.8 mm. The facial nerve and the nervus intermedius lie above and slightly anterior to CN VIII. This drawing shows the contents of the right internal acoustic meatus. Note the relationship between the nervus intermedius (ie, nerve of Wrisberg) and the facial nerve. Also note the superior location of the facial nerve relative to the vestibulocochlear nerve. The nervus intermedius conveys (1) afferent taste fibers from the chorda tympani nerve, which come from the anterior two thirds of the tongue; (2) taste fibers from the soft palate via the palatine and greater petrosal nerves; and (3) preganglionic parasympathetic innervation to the submandibular, sublingual, and lacrimal glands. The fibers for taste originate in the nucleus of the tractus solitarius (NTS), and the fibers to the lacrimal, nasal, palatal mucus, and submandibular glands originate in the superior salivatory nucleus. 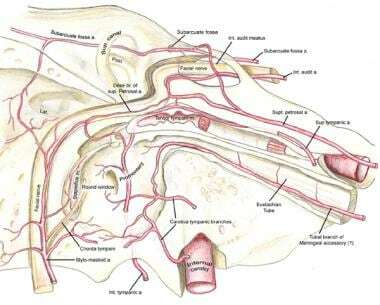 Fibers to the lacrimal gland are carried with the greater petrosal nerve until it exits the skull, at which point the fibers join the deep petrosal nerve (sympathetic fibers) to form the nerve of the pterygoid canal (Vidian nerve), as shown in the image below. Schematic illustration shows the facial nerve and its peripheral connections. Note the interconnections of cranial nerve (CN) VII with CN V, CN IX, and CN X. The nervus intermedius also has a small cutaneous sensory component from afferent fibers originating from a small portion of the auricle and postauricular area. The close anatomic association between the facial nerve, the nervus intermedius, and the vestibulocochlear nerve at the level of the CPA and in the IAC may result in disturbances in tearing, taste, salivary gland flow, hearing, balance, and facial function as a result of lesions at this level. Common examples are the symptoms of tinnitus, unilateral hearing loss, and balance disturbances often associated with acoustic schwannomas. Large acoustic schwannomas may progress to involve the facial nerve and even CN V, CN IX, CN X, and CN XI. At the fundus of the IAC, the falciform crest (crista falciformis) divides the IAC into superior and inferior compartments. The facial nerve passes along the superior part of the ledge, separated from the superior vestibular nerve by a vertical bony ridge named the Bill bar (after the esteemed Dr William House). The facial nerve travels through the petrous temporal bone, as shown in the image below, in a bony canal called the facial or fallopian canal (after Gabriel Fallopius). No other nerve in the body travels such a long distance through a bony canal. Because of this bony shell around the nerve, inflammatory processes involving the central nervous system (CNS) and the facial nerve or traumatic injuries to the temporal bone can produce unique complications. 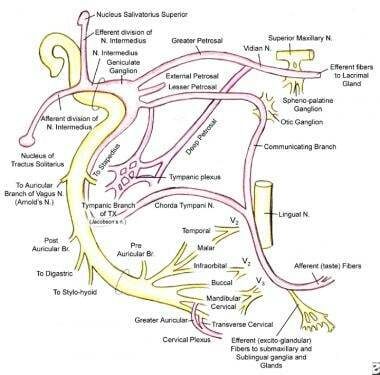 The transtemporal course of the facial nerve is shown. Note the vascular arcades feeding the facial nerve throughout its course in the bony facial canal. The labyrinthine segment of the facial nerve lies beneath the middle cranial fossa and is the shortest segment in the facial canal (approximately 3.5-4mm in length). In this segment, the nerve is directed obliquely forward, perpendicular to the axis of the temporal bone, as shown above. The facial nerve and the nervus intermedius remain distinct entities at this level. The term labyrinthine segment is derived from the location of this segment of the nerve immediately posterior to the cochlea. The nerve is posterolateral to the ampullated ends of the horizontal and superior semicircular canals and rests on the anterior part of the vestibule in this segment. The labyrinthine segment is the narrowest part of the facial nerve and is susceptible to compression by means of edema. This is the only segment of the facial nerve that lacks anastomosing arterial cascades, making the area vulnerable to embolic phenomena, low-flow states, and vascular compression. After traversing the labyrinthine segment, the facial nerve changes direction to form the first genu (ie, bend or knee), marking the location of the geniculate ganglion. The geniculate ganglion is formed by the juncture of the nervus intermedius and the facial nerve into a common trunk. The geniculate ganglion is the sensory ganglion of the facial nerve, supplying taste fibers from the anterior two-thirds of the tongue via chorda tympani, as well as taste fibers from the palate via the greater petrosal nerve. The greater petrosal nerve branches from the geniculate ganglion, and there may be an additional branch, the external petrosal nerve. The greater petrosal nerve emerges from the upper portion of the ganglion and carries secretomotor fibers to the lacrimal gland. The greater petrosal nerve exits the petrous temporal bone via the hiatus for the greater petrosal nerve to enter the middle cranial fossa. The nerve passes deep to the trigeminal (Gasserian) ganglion and across the foramen lacerum, to enter the pterygoid canal. In the pterygoid canal, the greater petrosal nerve joins the deep petrosal nerve to become the nerve of the pterygoid canal. The parasympathetic axons in this nerve synapse in the pterygopalatine ganglion; postganglionic parasympathetic fibers, which are carried via branches of the maxillary (V2) divisions of the trigeminal nerve (CN V), innervate the lacrimal gland and mucus glands of the nasal and oral cavities. The tympanic segment extends from the geniculate ganglion to the horizontal semicircular canal and is 8-11mm in length. The nerve passes behind the cochleariform process and the tensor tympani. The cochleariform process is a useful landmark for finding the facial nerve. The nerve lies against the medial wall of the tympanic cavity, above and posterior to the oval window. The wall can be very thin or dehiscent in this area, and the middle ear mucosa may lay in direct contact with the facial nerve sheath. The facial canal has been reported to be dehiscent in the area of the oval window in 25-55% of postmortem specimens. Always anticipate finding a dehiscent or prolapsed facial nerve in its tympanic segment, especially in patients with congenital ear deformities. The distal portion of the facial nerve emerges from the middle ear between the posterior wall of the external auditory canal and the horizontal semicircular canal. This is just distal to the pyramidal eminence, where the facial nerve makes a second turn (marking the second genu). The most important landmarks for identifying the facial nerve in the mastoid are the horizontal semicircular canal, the fossa incudis, and the digastric ridge. The second genu of the facial nerve runs inferolateral to the lateral semicircular canal. This is a relatively constant relationship. In cases in which the lateral canal is difficult to identify (eg, cholesteatoma, tumor), the use of other landmarks, along with cautious exploration, is advised. The digastric ridge points to the lateral and inferior aspect of the vertical course of the facial nerve in the temporal bone. In poorly pneumatized temporal bones, the digastric ridge may be difficult to identify. The distal aspect of the tympanic segment can be surgically located via a facial recess approach. The chorda tympani nerve and the fossa incudis can be used to identify the nerve when performing a facial recess approach, shown in the image below. Exposure of the facial nerve after a cortical mastoidectomy. The facial recess has been opened by thinning of the posterior canal wall. The recess is identified using the incus, chorda tympani, and horizontal semicircular canal as landmarks. The long process of the incus points toward the facial recess. The chorda tympani nerve serves at the lateral margin of the triangular facial recess. 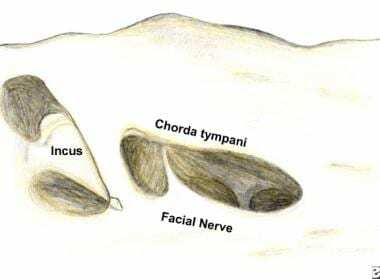 The chorda tympani nerve can be exposed along its length and can be followed inferiorly and medially to its takeoff from the main trunk of the facial nerve. In practice, surgeons most likely employ cues from all these landmarks in respecting the integrity of the facial nerve. The second genu marks the beginning of the mastoid segment. The second genu is lateral and posterior to the pyramidal process. The nerve continues vertically down the anterior wall of the mastoid process to the stylomastoid foramen. The mastoid segment is the longest part of the intratemporal course of the facial nerve, approximately 10-14mm long. During middle ear surgery, the facial nerve is most commonly injured at the pyramidal turn. The 3 branches that exit from the mastoid segment of the facial nerve are (1) the nerve to the stapedius muscle, (2) the chorda tympani nerve, and (3) the nerve from the auricular branch of the vagus. The auricular branch of the vagus nerve arises from the jugular foramen and joins the facial nerve just distal to the point at which the nerve to the stapedius muscle arises. Pain fibers from the external acoustic meatus may be carried with this nerve. The chorda tympani is the terminal branch of the nervus intermedius. The chorda runs laterally in the middle ear, between the incus and the handle of the malleus, and forward across the inner aspect of the upper portion of the tympanic membrane. After passing through the tympanic cavity in this way, the nerve exits the base of the skull through the petrotympanic fissure (ie, canal of Huguier) to join the lingual nerve. The chorda tympani nerve carries preganglionic parasympathetic secretomotor fibers to the submandibular and sublingual glands. The chorda also carries special sensory afferent fibers (ie, taste fibers) from the anterior two-thirds of the tongue and fibers from the posterior wall of the external acoustic meatus responsible for pain, temperature, and touch sensations. The facial nerve exits the facial canal via the stylomastoid foramen. The nerve travels between the digastric and stylohyoid muscles and enters the parotid gland. A number of useful landmarks are used to locate the facial nerve. Topographic landmarks, shown in the image below, can serve as guides for locating the course of the facial nerve and its branches. For example, a line drawn between the mastoid tip and the angle of the mandible can serve as a useful landmark for the superior limits of a neck dissection. Removal of parotid tissue inferior to this line can be performed relatively safely. Surgical landmarks to the facial nerve include the tympanomastoid suture line, the tragal pointer, and the posterior belly of the digastric muscle. The tympanomastoid suture line lies between the mastoid and tympanic segments of the temporal bone and is approximately 6-8 mm lateral to the stylomastoid foramen. The main trunk of the nerve can also be found midway between (10 mm posteroinferior to) the bluntly pointed medial edge of the tragal cartilage, the so-called "tragal pointer", and the posterior belly of the digastric muscle. The nerve is usually located inferior and medial to the pointer. During surgical dissection, the surgeon may encounter a branch from the occipital artery that lies lateral to the facial nerve. Brisk bleeding at this time may be a sign that the nerve is in close proximity; hemostasis should be obtained using bipolar electrocautery, and further dissection should proceed cautiously. The styloid process is deep to the main trunk of the nerve. In the infant and young child, these landmarks are not applicable because of differences in the rate of anatomic development of the parotid gland and mastoid. The modified Blair incision most commonly used in adults is often avoided in children because the facial nerve is located more superficially, and the risk of injury is increased with elevation of the skin flaps. Many textbooks on pediatric otolaryngology provide detailed descriptions of the safe placement of surgical incisions for exposing the facial nerve and its branches in children. Once it has exited the facial canal at the stylomastoid foramen, the facial nerve gives off several rami before it divides into its main branches. 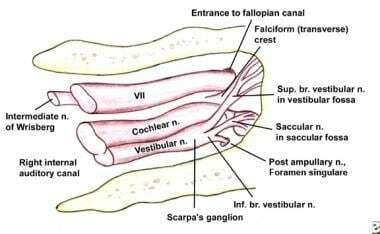 A sensory branch exits the nerve immediately below the stylomastoid foramen and innervates the posterior wall of the external acoustic meatus and a portion of the tympanic membrane. Next, the posterior auricular nerve leaves the facial nerve and innervates the posterior auricular and occipitalis muscles. Two small branches innervate the stylohyoid muscle and posterior belly of the digastric muscle. The facial nerve crosses lateral to the styloid process and enters the parotid gland. The nerve lies in a fibrous plane that separates the deep and superficial lobes of the parotid gland. In the parotid gland, the nerve divides into two major divisions at the so-called pes anserinus; ie, the superiorly directed temporofacial and the inferiorly directed cervicofacial divisions of the facial nerve. The facial nerve innervates all of the muscles of facial expression. Of these, the facial nerve innervates 14 of the 17 paired muscle groups of the face on their deep side. The three muscles innervated on their superficial or lateral edges are the buccinator, levator anguli oris, and mentalis muscles. Frequent connections between the buccal and zygomatic branches exist. The temporal and marginal mandibular branches are at highest risk during surgical procedures and are usually terminal connections without anastomotic connections. The superficial musculoaponeurotic system (SMAS) is a superficial fascial layer that extends throughout the cervicofacial region. In the lower face, the SMAS invests the facial muscles and is continuous with the platysma muscle. Superiorly, the SMAS ends at the level of the zygoma because of attachments of the fascial layers to the zygomatic arch. The temporoparietal fascia is not continuous with the SMAS, but they are most likely embryologic equivalents. The temporoparietal fascia extends from the zygomatic arch as an extension of the deep temporal fascia. In the temporal region, the temporal branch of the facial nerve crosses the zygomatic arch and courses within the superficial layer of the deep temporal fascia (temporoparietal fascia). In the scalp, the equivalent of the SMAS is the galea aponeurotica, which splits is the aponeurotic attachment for the frontalis, occipitalis, procerus, and some of the auricular muscles. In the upper face, the neurovascular structures exit their bony foramina and penetrate the SMAS to run within its superficial aspects or on its surface. The SMAS encloses all of the facial muscles and is their only attachment to the overlying dermis, thus transmitting contractions of the facial muscles to the overlying skin. A conceptual understanding of the anatomy of the SMAS is important to the surgeon. In the lower face, the facial nerve always runs deep to the platysma and SMAS and innervates the muscles on their undersurfaces (except for the buccinator, levator anguli oris, and mentalis muscles). The SMAS also helps the surgeon to identify the location of the facial nerve during dissection toward the midline of the face, where the nerve can be found running on top of the masseter muscle just below the SMAS. The relationships of the temporal branch are complex and only briefly described in this article. Refer to Larrabee and Makielski for a more complete anatomic description. The temporal branch of the facial nerve exits the parotid gland and runs within the SMAS over the zygomatic arch into the temple region. The temporal branch enters the undersurface of the frontalis muscle and lies superficial to the deep temporalis fascia. To avoid injury to the temporal branch during elevation of facial flaps, the surgeon should elevate either in a subcutaneous plane or deep to the SMAS. The marginal mandibular branch lies along the body of the mandible (80%) or within 1-2 cm below (20%). This is a critical landmark in head and neck surgery. The marginal mandibular branch lies deep to the platysma throughout much of its course. It becomes more superficial approximately 2 cm lateral to the corner of the mouth and ends on the undersurface of the muscles. Injury to the marginal mandibular branch results in paralysis of the muscles that depress the corner of the mouth. The spectrum of facial motor dysfunction is wide, and characterizing the degree of paralysis can be difficult. Several systems have been proposed, but since the mid-1980s, the House-Brackmann system has been widely used. In this scale, grade I is assigned to normal function, and grade VI represents complete paralysis. Intermediate grades vary according to function at rest and with effort. The House-Brackmann designations are summarized in Table 4, below. The cortical motor area of the face is supplied by the artery of the central sulcus (Rolandic artery) from the middle cerebral artery. Within the pons, the facial nucleus receives its blood supply primarily from the anterior inferior cerebellar artery (AICA). The AICA, a branch of the basilar artery, enters the internal acoustic meatus (internal auditory canal [IAC]) with the facial nerve. The AICA branches into the labyrinthine and cochlear arteries. The superficial petrosal branch of the middle meningeal artery is the second of three sources of arterial blood supply to the extramedullary (ie, intrapetrosal) facial nerve. 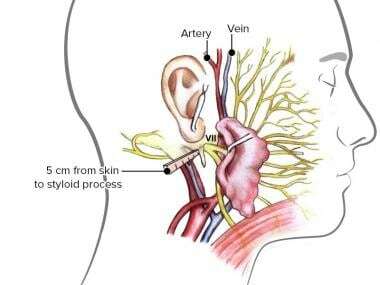 The posterior auricular artery supplies the facial nerve at and distal to the stylomastoid foramen. Venous drainage parallels the arterial blood supply. Crosby ED, DeJonge BR. Experimental and clinical studies of the central connections and central relation of the facial nerve. 1963. 72:735 - 755. Nelson JR. Facial paralysis of central nervous system origin. Otolaryngol Clin North Am. 1974 Jun. 7(2):411-24. [Medline]. Jenny AB, Saper CB. Organization of the facial nucleus and corticofacial projection in the monkey: a reconsideration of the upper motor neuron facial palsy. Neurology. 1987 Jun. 37(6):930-9. [Medline]. Mavrikakis I. Facial nerve palsy: anatomy, etiology, evaluation, and management. Orbit. 2008. 27(6):466-74. [Medline]. May M, Schaitkin B. May M, Schaitkin B, eds. The Facial Nerve, 2nd Edition. New York, NY: Thieme; 2000. Pitanguy I, Ramos AS. The frontal branch of the facial nerve: the importance of its variations in face lifting. Plast Reconstr Surg. 1966 Oct. 38(4):352-6. [Medline]. Larrabee WF Jr, Makielski KH. Surgical Anatomy of the Face. New York: Raven Press; 1993.